It seems like everything is getting smaller in Germany. I read today that Germany’s longest word (63 letters) has been abandoned. It also seems that their jobs are getting smaller and more people are being forced into them. The so-called “mini-jobs”. Meanwhile Europe’s crowning glory and austerity’s greatest achievement lies a little south of the mini-job kingdom. Eurostat’s latest – Regional labour force data – tells us that in some regions in Spain and Greece, the unemployment rates of the 15-24 year olds have topped 70 per cent and will continue to rise. There are now an increasing chorus in the media from politicians and financial market types who are trying to dress all this up as good news. Apparently, the Greek share market is booming. The agenda is clear – if they can somehow convince the world that the devastation of Greece is “good news” then it will reduce the growing resistance to austerity that is starting to broaden the debate. The elites don’t want any moderation. So they have to re-construct devastation to appear to be bringing good outcomes. The madness continues. Tell the 15-24 year olds in Dytiki Makedonia that things are going along swimmingly! Germany’s longest word – Rindfleischetikettierungsuberwachungsaufgabenubertragungsgesetz, the 63-letter title of a law about beef – has ceased to exist. That is a long word. Apparently, it was not in the dictionary but was in official usage. What about this German word? That seems to be around 93 characters. But other things are getting smaller in Germany as well. The Wall Street Journal article (May 29, 2013) – ‘Minijobs’ Lift Employment But Mask German Weakness – tells us that the upbeat talk about Germany as a success surrounded by failure is somewhat mistaken. … nearly one in five working Germans, or about 7.4 million people, hold a so-called “minijob,” a form of marginal employment that allows someone to earn up to €450($580) a month free of tax. Minijobs pay low wages and do not provide the standard statutory benefits (holiday pay etc). While Germany’s top earners among full-time workers who contribute to the social security system saw pay rise 25% between 1999 and 2010, salaries in the lowest quintile increased roughly 7.5% … After inflation of about 18% during that period, Germany’s lowest wages dropped significantly. The minijobs were part of the Hartz reforms, which I briefly discuss below. The neo-liberals also claimed they formed part of the “stepping stone” upgrading where a young person could first take a casual job and then progress up to more regular, high paid positions. The evidence in Germany (and everywhere for that matter) disputes this claim. The point is that part of the Euro crisis that is least reported is the way that Germany responded to the loss of its exchange rate. Previously, the Bundesbank had manipulated the Deutsch mark parity to ensure the German export sector remained very competitive. That is one of the reasons they became an export powerhouse. It is the same strategy that the Chinese are now following and being criticised for by the Europeans and others. Once the Germans lost control of the exchange rate by signing up to the EMU they had to manipulate other “cost” variables to remain competitive. So the Germans were aggressive in implementing their so-called “Hartz package of welfare reforms”. A few years ago we did a detailed study of the so-called Hartz reforms in the German labour market. One publicly available Working Paper is available describing some of that research. The Hartz reforms were the exemplar of the neo-liberal approach to labour market deregulation. They were an integral part of the German government’s “Agenda 2010″. They are a set of recommendations into the German labour market resulting from a 2002 commission, presided by and named after Peter Hartz, a key executive from German car manufacturer Volkswagen. The recommendations were fully endorsed by the Schroeder government and introduced in four trenches: Hartz I to IV. The reforms of Hartz I to Hartz III, took place in January 2003-2004, while Hartz IV began in January 2005. The reforms represent extremely far reaching in terms of the labour market policy that had been stable for several decades. The Hartz process was broadly inline with reforms that have been pursued in other industrialised countries, following the OECD’s job study in 1994; a focus on supply side measures and privatisation of public employment agencies to reduce unemployment. The underlying claim was that unemployment was a supply-side problem rather than a systemic failure of the economy to produce enough jobs. The reforms accelerated the casualisation of the labour market (so-called mini/midi jobs) and there was a sharp fall in regular employment after the introduction of the Hartz reforms. The rapid increase in the minijobs is a reflection of these deep-seated changes and have created a situation where an increasing (and sizeable) proportion of German workers are now excluded from enjoying the benefits of national income growth in that nation. The German approach overall had overtones of the old canard of a federal system – “smokestack chasing”. One of the problems that federal systems can encounter is disparate regional development (in states or sub-state regions). A typical issue that arose as countries engaged in the strong growth period after World War 2 was the tax and other concession that states in various countries offered business firms in return for location. There is a large literature which shows how this practice not only undermines the welfare of other regions in the federal system but also compromise the position of the state doing the “chasing”. But in the context of the EMU, the way in which the Germans pursued the Hartz reforms not only meant that they were undermining the welfare of the other EMU nations but also droving the living standards of German workers down. And then the crisis emerged amidst all this. I am giving a lecture in Darwin tonight on austerity – a triumph of ideology over evidence. I dug out some of the quotes that have been made along the way by big-noting politicians and others which have marked the austerity route over the last 4-5 years. There are, of-course, countless similar quotes that I could have drawn out. Have a laugh at these prescient individuals. C-SPAN host Steve Scully: You know the numbers, $1.7 trillion debt, a national deficit of $11 trillion. At what point do we run out of money? The latest research suggests that once debt reaches more than about 90% of GDP the risks of a large negative impact on long term growth become highly significant. Right on the mark with our Excel spreadsheet Mavens. They are absolutely clear that the deficit reduction plan is not responsible; in fact, quite the opposite. … recall that public debt in the EU has risen from about 60% of GDP before the crisis to around 90% of GDP. And it is widely acknowledged, based on serious academic research, that when public debt levels rise above 90% they tend to have a negative impact on economic dynamism, which translates into low growth for many years. That is why consistent and carefully calibrated fiscal consolidation remains necessary in Europe. Clearly extolling the Excel spreadsheet skills of Ken and Carmen. As the sole manufacturer of dollars, whose debt is denominated in dollars, the U.S. government can never become insolvent, i.e., unable to pay its bills … In this sense, the government is not dependent on credit markets to remain operational. Together with the unusually high, but manageable, level of the current debt, these facts imply that the current U.S. government can wait out any short-term economic developments until long-run growth is restored … Further, without an immediate need to drastically reduce the debt, the mechanism between high debt and slow growth loses most of its credibility. The last quote seems to tell a different story – and it is one that the likes of Cameron, Osborne, the litany of European elites, and the rest of them should take time to learn. Anyway, put all this together and you can see what these characters have created. This graph (using the latest Eurostat data) shows the evolution of unemployment rates for youth (15-24 years) from 1983 to April 2013. The next Table shows the unemployment rates for youth (15-24 years) for NUTS2 Regions for Greece and Spain at 1999 and 2012 (with the Change being the percentage point change between 1999 and 2012). They are ranked from highest to lowest as at 2012. In the first few months of 2013, the levels have deteriorated further. These are Depression level numbers and will ensure the legacy of the policy failure spans several generations. We produced a map (thanks to Michael in CofFEE) of the unemployment rate situation for youth in the EU as at 2012. The red areas are for unemployment rates above 35 per cent. The spatial clustering is highly significant and the spill-overs between the regions strong. That tells me that there is a systematic factor operating on a spatial basis – and I don’t think there has been an outbreak of laziness in any spatially concentrated form. I was thinking about this data when I read this article in the Financial Times (May 30, 2013) – Greece’s good news goes largely unreported. The article is part of an emerging chorus coming from the neo-liberals about how good things are becoming in Greece and soon we will hear the same about Spain and the whole monetary union. The author of this particular gem is a so-called “strategist on the markets insight team” at a large investment fund. I presume they have some trades on that need the markets to think a growth outbreak is about to occur in Greece. Why else would she write such drivel? Apparently, the Athens Composite, a share index is “the best performing stock market index in Europe over the past year” which according to the author is a sign that recovery is about to become endemic in Greece. The ECB took care of the bond market boycott of Greek debt. That is not a problem. The problem is a chronic lack of aggregate demand and a rapid hollowing out of everything that an advanced economy would consider to be the pre-requisites of development. The author claims that while the labour market remains weak, the attack on wages and conditions will improve competitiveness. I showed in this blog – It’s all been for nothing – that is, if we ignore the millions of jobs lost etc – that international competitiveness in Greece is now lower not higher than it was before the crisis. Following the crisis, the general tendency has been for real effective exchange rates to decline. However, the real effective exchange rate for Greece was higher in April 2013 (Index value = 101.6) than in January 2008 (Index value = 100) as the crisis was developing. By comparison, the real effective exchange rate for Germany is now at 93.5. For the euro area overall the index is now at 91.9. Of the peripheral nations, only Ireland has seen a substantial drop in its real effective exchange rate (now at 88.7). The rest of the so-called PIIGS have seen their real effective exchange rate fall only marginally during the austerity period. 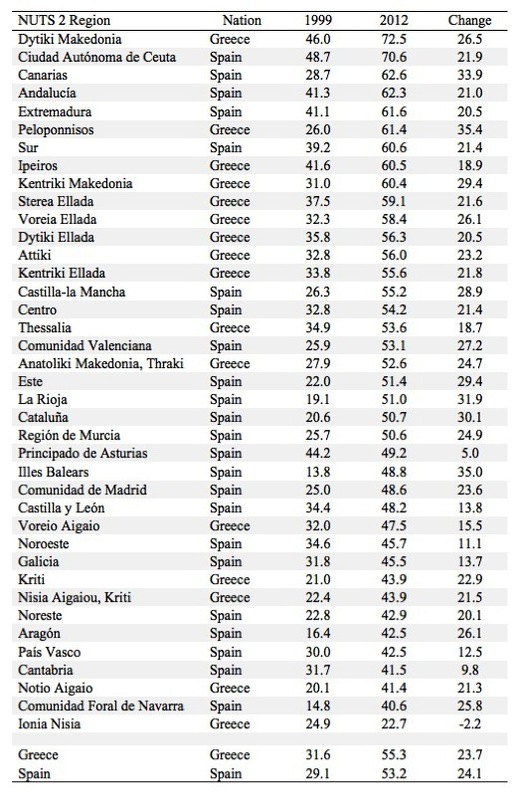 the index values as at April 2013 were staying 99.3, Portugal 98.2, and Italy 98.2. …. average unit labour costs have declined 14 per cent since the 2009 peak. The effect of this, together with weak domestic demand, has been a steady improvement in the current account deficit, which fell to 5 per cent in September 2012, from 16 per cent in 2009. Tackling the persistent current account deficit is key to long-term growth, and to debt sustainability, so this is welcome news. 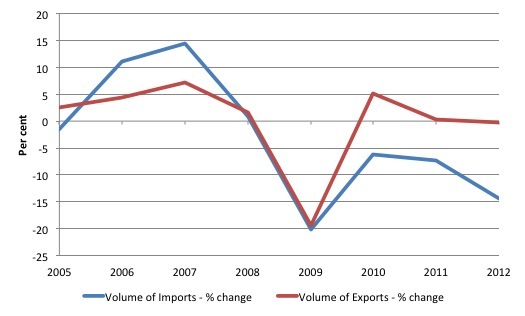 The following graph (using IMF WEO data) shows the annual percentage change in real imports (blue) and real exports (red) from 2005 to 2012. This is hardly a sign that there is an explosion of exports going on as implied by the FT article. The so-called “steady improvement” has largely come from a dramatic decline in imports, which reflects the Depression that the economy has been driven into by the elites. It represents a dramatic collapse in standards of living in that nation. She goes on to talk about the “headcount reductions in the civil service and the liberalisation of regulated professions, tourism and much of the retail sector” and the privatisation of state-owned enterprises etc as “good news”. As an after thought she tells us that the fire sale of state assets is only likely to raise “half of what was initially projected, but at least some progress is being made”. Sure, the public wealth is being taken over by rich elites who get it at bargain prices. And in the meantime the phalanx of lawyers and management consultants employed to broker the sales make a fortune. That may help convince investors that the eurozone can embrace supply-side reform and need not be hostage to economic elites. None of this is to trivialise the risks, which remain considerable, but it does show that sometimes the reality is better than the dramatic headlines might suggest. 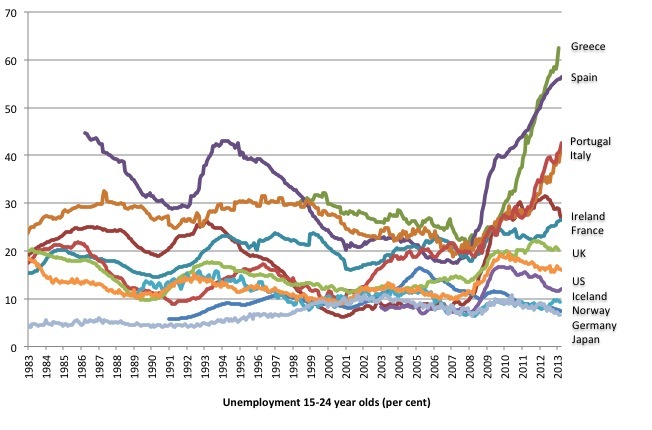 But the reality is that 72 per cent (and rising) of the 15-24 years olds in some Greek regions cannot find work. They are facing a lifetime of disadvantage. They will have unstable work histories if they ever get work. They will be at high risk of developing physical and mental maladies. They will create unstable families and perpetuate the disadvantage. This “good news” will reverberate for generations. Perhaps the financial markets will clean up again in Greece. But the fabric of the society will be damaged forever and the damage is going to mount as the crisis continues. The weak labour market is where concentration should be focused not what the wealth shufflers are doing on the Athens Composite. And then in the UK, the Opposition Chancellor demonstrated yesterday that he has well and truly lost it and his leader should sack him immediately. The UK Guardian article yesterday (June 3, 2013) – As Labour’s iron man, Ed Balls could do the trick – related how Ed Balls would cut spending hard under a Labour government. The journalist Polly Toynbee assessed his contribution as being an “impressive speech set out a credible economic plan, tough as titanium – too tough for some Labour tweeters”. Which tells me she knows nothing about economics. The UK needs a substantial increase in the Budget deficit at present and under the current economic trajectory, that will not alter by the time the people vote to elect the next national government. The problem is that they have no-one credible to vote for in the UK. All sides of politics are now infested with the neo-liberal disease of ignorance and malice. On the bright side we have the solution to our energy crisis sorted. Bill, you talk about the Hartz Concept driving down living standards, but it seems it contributed to lower unemployment also. Livings standards might be lower still if not for increased flexibility. I get the impression from the link below and other sources that Angela Merkel thinks austerity is needed in Germany in order to make Germany competitive relative to Asia, China, etc. That’s nonsense of course: austerity is “needed” for the less competitive countries WITHIN the EZ – that’s the bizarre and not very effective way of dealing with competitiveness disparities WITHIN a common currency area. But for the EZ as a whole, any lack of competitiveness can be dealt with by adjusting the exchange rate between the Euro and other countries. However, before passing final judgement on Merkel, I’d like to see the full text of her Davos speech. But I can’t find it. Anyone know where it might be? Bill, reading all of Polly Toynbee’s article leads me to think that she knows some (but not enough by MMT standards) economics for example she mentions Keynes Paradox of Thrift and clearly thinks Osborne’s austerity drive is nonsense and damaging. She also explains the political reality that Labour faces: it is blamed (incorrectly) for the economic crisis the UK faces and it will not get into power unless that changes. One could argue that a complete change from neoliberal orthodoxy is required (by everyone!) but, for politicians at least, the first rule is to get into power and for that the voters have to believe in you. Whatever the arguments for clearly explaining an MMT like view of the economy and coming up with corresponding policy, Balls, Milliband et.al. believe they have their hands tied. I think they are right, I also know that MMT more correctly describes and predicts the economic world around me than does the orthodoxy that has an iron grip on the UK electorate at large. I would not want to be a politician. Eurostat’s latest – Regional labour force data – tells us that in some regions in Spain and Greece, the unemployment rates of the 15-24 year olds have topped 70 per cent and will continue to rise. There are now an increasing chorus in the media from politicians and financial market types who are trying to dress all this up as good news. Apparently, the Greek share market is booming. The day the news comes that children are dying all over Europe, the Euro elites will tell us that the news is good, because the plague of deaths means growing investment opportunities in brothels staffed by poor, childless, low-wage prostitutes with no mouths to feed and very flexible work hours. What’s happening in Europe is a crime against humanity. It’s time for all of us to begin to formulate a much more effective and drastic political strategy against this evil. Stephanie Flanders (BBC) makes the same point as mine (above) that Labour (in the UK) have decided that to talk neoliberal orthodoxy is the way to win the next election whatever they really believe. The numbers would seem to indicate that the capitalist system in places like Greece is an catabolic state. That is to say the unproductive elites are growing ever wealthier by eating away the productive base (human and fixed productive assets) of nations. This trend is clearly unsustainable. It’s much like dismantling a wooden house room by room in a bitter winter and feeding the timber into your main hearth. There comes a time when the only room left is the one you are in. When you pull those walls down to feed your fire the bitter winds enter and it is all over. Or you can choose to keep the last room and stiffen in it as the fire dies out. Either way, the end point is coma and death. For the economies applying austerity the end point would be coma and death except that people will rise in anger and rebel at some point rather than meekly die of cold and hunger. Thus, we can confidently predict the end point will be revolution and then battles between the forces of revolution and reaction. This is if austerity is not abandoned before it does too much damage. It seems we are now likely to see revolutions and civil wars right around the seaboard of the Mediterranean; Tunisia, Libya, Egypt, Syria, Turkey… and is Greece next? The situations are far from stabilised in Tunisia, Libya and Egypt. In many ways, they have merely concluded their respective phase ones. Behind austerity (the dearth you don’t have to have) lurks limits to growth (the dearth you do have to have). Since we have not grappled with the issues of transitioning to a sustainable economy, we are stuck with an economy that cannot adapt to limits. Part of the trouble in the world now is due to austerity but put is also limits to growth. And the same situation obtains here in the US, where Democrats pay lip service to GOP “deficit hawks” and only insist that “more revenue” be provided so that there is a “balanced” approach. Fortunately neither side has the votes to prevail – so we merrily roll along with yet another debt ceiling increase (coming this September to a theatre near you … ! ), accompanied by the usual chorus of talk radio and its assorted fruits and nuts howling about about “insolvency.” It’ll drive you crazy if you let it … but somehow our economy is sputtering forward and becoming that “beacon of hope” for Euro-land and points east. I continue to marvel at the whole thing, and heartily vote for divided government as it seems the only thing that is saving us from neo-liberal madness (whether that comes in red or blue shades)…. Carry on, Bill – greatly enjoyed this installment and thanks for that colorful map. I will be sure to use it at the next meeting of my investment club. The problem is that they are not merely talking neoliberal. The neoliberal line has been so drilled into everyone’s heads over the last thirty-some years that people now speak it because they know no other words. This has become obvious to me of late as I listen to even America’s “great liberal hope”, Bernie Sanders, whose vision is unquestioningly liberal, but who now unquestioningly believes that government spending MUST be cut, so much so that (I’m told) he has kicked at least one MMTer to the street for trying to explain to him otherwise. PS. : I absolutely like your blog and most times find myself in absolute agreement with what you have to say.